Offering the best of Southern Hospitality and some of the most knowledgeable staff to be found along the Grand Strand, Forest Dunes offers 1 and 3-bedroom units in a great oceanfront location with convenient access to the world famous attractions of both Myrtle Beach and North Myrtle Beach. Resort amenities include indoor and outdoor pools, whirlpool, kiddie pool, a lazy river ride, and an oceanside fitness trail. 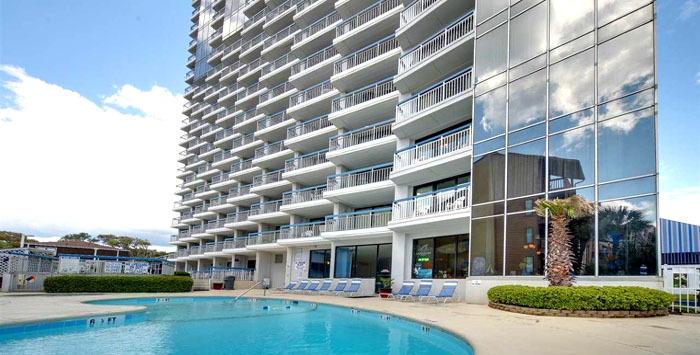 These condos are located on the far north end of Myrtle Beach, known as the "golden mile" which is the preferred part of the city. Traffic is lighter, the neighborhoods are safe, and the resort is centrally located to attractions such as Broadway at the Beach as well as Restaurant Row and the big live theaters close by. The majority of the units at Forest Dunes Resort are one bedroom. The resort was a hotel before the condo boom in the 2000's saw everything become a condo-hotel. Built in the 1980's. all the units were completely renovated and upgraded to be resort condos. There are a few units that are 3 bedrooms as well. Prices average around $100,000 for the one bedrooms and $200-250,000 for the three bedroom condos. Browse the units for sale below and give us a call if you're interested in the condos in Forest Dunes. We'll be glad to show you around here as well as any other resort you'd like to see. That's what we're here for - Call us!